The study of complex networks has acquired great importance during the last years because of the diffusion of several phenomena which can be described by these networks. Community detection is one of the most investigated problem in this area, however only a few solutions for detecting communities in a distributed and dynamic environment have been presented. In this paper we propose SONIC-MAN, a distributed protocol to detect and manage communities in a peer-to-peer dynamic environment. Our approach is particularly targeted to distributed online social networks and its main goal is to discover communities in the ego-network of the users. SONIC-MAN is based on a Temporal Trade-off approach and exploits a set of super-peers for the management of the communities. 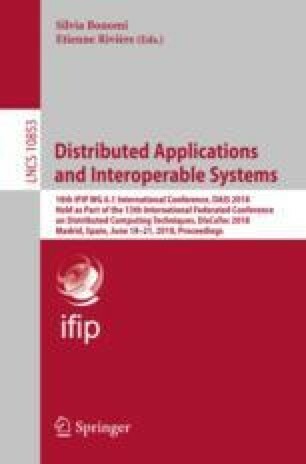 The paper presents a set of evaluations proving that SONIC-MAN is able to detect dynamic communities in a distributed setting and to return results close a centralized approach based on the same basic algorithm for community discovering.